Ratio trading is a relatively new options trading technique, used only by about the top one percent of all traders in the world. Simply put, it is taking two different but related financial instruments and trading them against each other. It needs to be distinguished from ratio spread trading, which is covered elsewhere on this site. We start by looking at stock charts with a twist. Instead of putting up just one financial instrument on our charts, we create a chart that compares the strength of one financial instrument against another. Most good broker platforms, such as ThinkorSwim, allow you to do this. One appealing feature of ratio trading is, that all the usual rules for chart technical analysis, work even better with these types of charts. There is a wide choice of financial instruments that you can compare. You can compare a variety of stock index related ETFs with one another, or individual stocks against their relevant index. For example, if you trade the US markets, you may wish to compare the performance of American Express against the Dow 30 index, which it forms part of. You can even do it with foreign currency ETFs, comparing one currency against the other. The important thing is to look for well defined trends. If there is any doubt whether a trend exists, leave it alone. The inherent weakness that comes with comparing one financial instrument against another, is that both may be trending in the same direction. Consequently, a ratio chart that shows one stock or ETF trending against the other may not necessarily mean that the price action of the favourable one is guaranteed to be moving in your anticipated direction. For example, two stock ETFs might be dropping together, but one is decisively plummeting while the other is just gently sliding south. A ratio chart would show the second ETF outperforming the first ETF, but if you went long the second one on this basis alone, you could lose money. So you still need to do your analysis in the context of the larger market. Short Exchange Traded Funds (ETFs) have only been in existence in the last few years. Consequently, they are not well known. Yet the dynamics between the long and short ETFs is nothing short of dramatic! Short ETFs are index related funds whose portfolio increases in value when the price action of the index falls. This is because they have leveraged derivatives and futures contracts related to the index. There are many short ETFs. There are also one-time ETFs, two-time, or three-time ETFs. The 3-time ETF means that for every one point rise in the long ETF, the short ETF loses 3 points and vice versa. For the purpose of ratio trading, you would only be interested in one-time ETFs. The long ETF for the S&P500 index is called the SPY. The short ETF for the S&P500 is called the SDS. So we plot the SPY against the SDS on a chart. Because these financial instruments work opposite to each other, there will be times when their respective line graphs cross over. We call this the equilibrium. But the area of the chart we are most interested in, is when we notice a change of direction beginning to form. Take a look at the image of the SPY/SDS ratio chart below. The SPY is plotted as the black line while the SDS is the blue line. 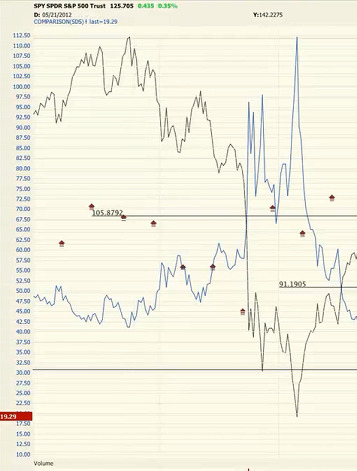 You'll notice that as the price action on the SPY begins to reverse, so price volatility becomes greater (note the jagged black lines at the top). However, at the same time, the price volatility for the SDS is not so volatile, even though it is supposed to mimic the moves of the SPY in reverse. When you get high volatility on the upside, together with lower volatility on the downside, it provides a strong clue that the market is about to reverse and, in this case, go down. Your strategy at this point would be to go long the SDS and short the SPY. Your target will be the equilibrium point (where the lines cross). Using options, you can leverage your profits at both ends. The same strategy can be employed when the SDS reaches a peak while the SPY is bottoming out. You look for high volatility on the upside of the chart, together with lower volatility on the downside - a strong clue that the market is about to reverse. 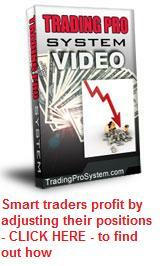 Ratio trading when understood correctly, is a very powerful way to pick market reversals. Using in-the-money options with a high delta, you can make the most of these trading opportunities and take home huge profits. Want to know more? The ratio trading system is explained in greater detail, with examples, in the last three modules of the Winning Trade System. It is a series of 16 advanced level options trading videos by veteran trader David Vallieres - his sequel to the best selling Trading Pro System.